Description: This sea chart (printed on thick paper for use at sea) shows the town of Bastia on the island of Corsica (Napoleon Bonaparte's birthplace). 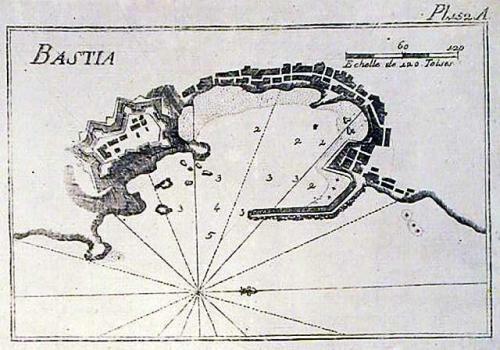 At the time of priniting Bastia was the Capital of Corsica. The chart shows depth soundings and anchorage points, the fort (or Bastiglia) and the development of the town around the bay.